I find cookbooks very inspirational, but I rarely use them. In fact, the only time I turn to cookbooks is for tried and true recipes I have been making for decades. When I get a new cookbook to review, I am always impressed with the variety of recipes. If your family is like mine, we get stuck in a rut of meals that are always the same. My hope is that a new cookbook will will change that offering a chance to explore new recipes. Unfortunately, our busy family lives leave little time for exploration coupled with not having all the ingredients already in our pantry. It can be difficult to make a list of ingredients, go to the store, and follow through on a new meal. Busy families need simple and easy solutions. From light bites to hearty meals and sweet treats, there is something for everyone. – Learn how to prepare a deeply delicious Lemon Capellini by Randy Fennoli of Say Yes to the Dress – Create delicious cupcakes courtesy of Katherine and Sophie from DC Cupcakes – Create budget conscious family meals from our very own Mama June from Here Comes Honey Boo Boo – Whip up a moist and rich Red Velvet Cake, with a recipe from Marisa Lopez the Season Two winner from The Next Great Baker – Treat yourself to a Marinated Skirt Steak, a Favorite of Jen Arnold and Bill Klein from The Little Couple – Indulge in a Chocolate-and-Vanilla Ice Cream Cake with a recipe created by Buddy Valastro from Cake Boss Whether you’re a beginner or advanced cook, we’re sure you’ll find a recipe inside that will soon become your own signature dish. Many of the recipes I cannot eat, as I am a vegetarian…but there’s always dessert! I am in love with a recipe for Rich Almond Cake and cannot wait to try it. The ingredients are simple, and the only thing not in my home is ricotta. Although I don’t watch many shows on TLC, I’ve heard of many of these shows. Who wouldn’t want to try a cake recipe from the Cake Boss? The photographs in this cookbook are mouth-watering! 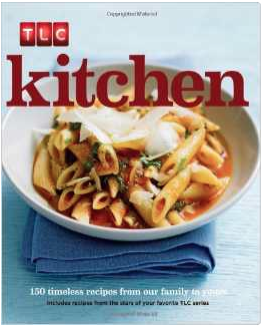 [amazon_link id=”1472304497″ target=”_blank” ]TLC Kitchen[/amazon_link] does not seem to be filled with exotic ingredients, like many cookbooks, and I think you will find most of them in your pantry already. I love having cookbooks around for when my mom visits. She loves to cook from recipes, and I love trying new things. I think she will like this one!